Kareena Kapoor Khan and Saif Ali Khan’s little superstar, Taimur has been a talk of the town ever since he stepped into this world. Camera lens of the paparazzi and many fans wait to catch his single glimpse. From being spotted at the airport to cheerfully smiling while looking at the cameras, adorable Taimur Ali Khan Pataudi is the heartthrob of the nation. Recently, the little prince charming was on his way to mommy Kareena’s best friend Amrita Arora’s house. 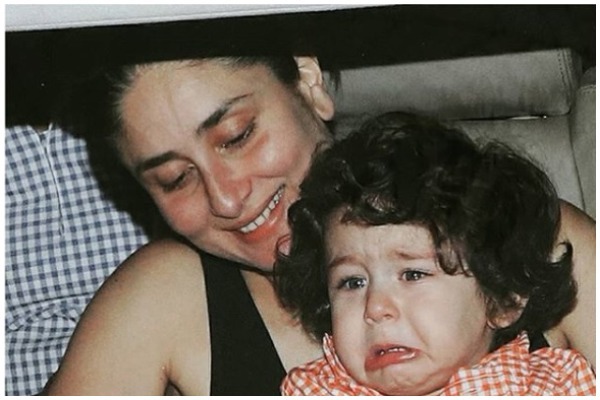 Taimur was spotted in a car with mom but this time in a cranky mood. Shutterbugs captured Taimur crying while mommy Kareena Kapoor Khan was trying to cheer him. Taimur, who is generally in a happy mood, was seen crying and this was heartbreaking for many. No doubt, he looks aww-adorable even when he is crying. Don’t you think so? Aren’t the mother-son duo looking amazing? ??? #taimuralikhan #taimur #taimuralikhanpataudi ?